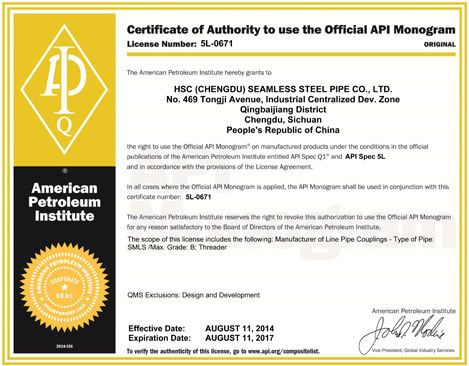 The HSC® Chengdu Seamless Steel Pipe Mill is certified in accordance with API 5CT (PSL1, PSL2 and PSL3) and API 5L (PSL1 and PSL2) for the steel grades of Group 1, 2, 3 and 4 by the American Petroleum Institute. 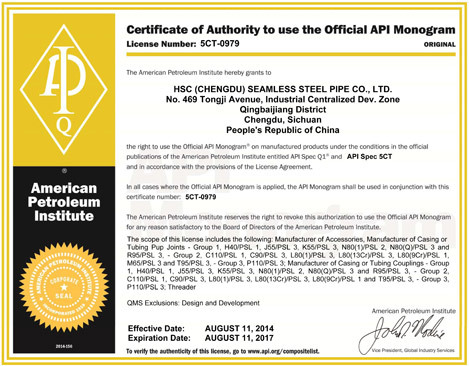 In addition, the HSC® Chengdu Mill's Quality Management System is fully compliant and certified with API Q1, which ensures the highest level of quality together with reliable deliveries. HSC® have developed, established and continue to maintain an integrated Health, Safety and Environment Management System (HSEMS) certified in accordance with ISO 14001 for the environment together with the GB/T 28001 (OHSAS 18001) for Occupational Health and Safety. 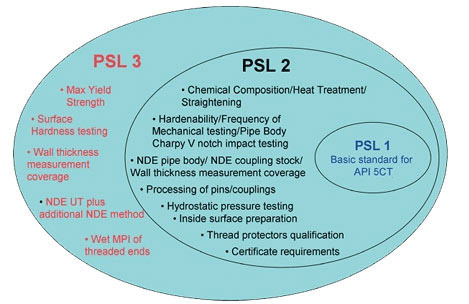 HSC® prides itself in achieving the most critical requirements of Product Specification Level 3 (PSL 3) for guaranteed quality in accordance with the advanced standards set by API.